Fierce and Fearless:	Colombia’s Trade Union Movement | Fight Back! Barrancabermeja, Colombia - It is 6:00 a.m. and one thousand oil workers surround the leaders of their union, USO (Union Sindical Obrero de la Industria del Petrolero). At the entrance to Ecopetrol, the national oil company, Jose Fernando Ramirez, the human rights director for USO, starts chanting, “Long live the oil workers union!” and then “Down with Plan Colombia!” Workers thunder their response. In Colombia, a country where three trade unionists are killed every week, this is a powerful act. Oil workers come close as militant union leader, Christo Sanchez, speaks against privatization of both their jobs and the company. Ecopetrol is violating their collective bargaining agreement and trying to unilaterally change the pension benefit. The workers are not having it. Barrancabermeja, where the name is bigger than the city, pumps huge amounts of oil. 60% of Ecopetrol’s oil is refined here. Behind the oil workers, twenty riot police line the street, while an armored personnel carrier and thirty fully-armed soldiers with snaking barbwire block the oil refinery entrance. 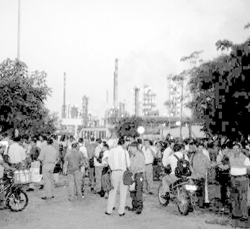 On this day, the Ecopetrol bosses use the soldiers to block the union leaders from entering the refinery to negotiate. This is the reality of the U.S. ‘Plan Colombia,’ the $2.1 billion in U.S. tax money spent for war and repression in Colombia. Until recently, the union ran the political life of this oil town. Now, the paramilitary death squads, a lethal extension of the Colombian Army, have moved in. Popular organizations are paying the price for Plan Colombia. At the USO rally, Pablo Araneles, a CREDHOS worker who escaped a death squad attack in 1998, protects the union leaders. A pacifist from the International Peace Brigades follows Pablo Araneles to protect him. The oil workers’ union is one of the strongest unions in Colombia, but they are not alone. In the city of Bogotá, there are many powerful unions with brave leaders. On Dec. 5, a Coca-Cola Workers’ Conference of more than three hundred trade unionists - plus lawyers, students and international solidarity activists - met to discuss the murder of eight Coca-Cola workers and the elimination of their union. The goal is a campaign in Colombia and the U.S. to force Coca-Cola to recognize the union and to stop the killing trade unionists. Javier Correa, the President of SINALTRAINAL, the food and beverage workers union, talked about having their union hall burned to the ground by paramilitaries. Grown men cried while describing their union brothers being shot at work. Lawyers told how Coca-Cola managers threaten to call paramilitary bosses if the workers refuse to sign union resignation letters. Professors spoke about U.S. and other multinational corporations carving up Colombia for profit. U.S. banks and corporations are all over Colombia. Along with the International Monetary Fund and World Bank, they are squeezing profits and spilling blood. In Bogotá, like other Colombian cities, the social movements are organized around the unions and the power of the working class. The students, urban poor, indigenous peoples and other sectors rally together with the unions. The teachers are especially influential, and their union, led by women, is among the most militant – defending the rights of the working class and the people as a whole. Their union hall is always busy, with meetings inside, debates on the front steps and discussions on the street. Bogotá, a city of seven million, is home to the more than one million people displaced by the U.S. Plan Colombia. Poor peasants and village folk are forced to live in the poorest, most overcrowded shantytowns on the sides of Bogotá’s mountains. The poor are displaced because U.S. warplanes and helicopters spray fumigants, similar to those used in the Vietnam War, on crops and rainforest areas the Colombian government wants cleared of people. Poor peasants are pushed into the cities as part of U.S. war strategy against the leftist rebels of the Revolutionary Armed Forces of Colombia and the National Liberation Army, often referred to by their acronyms in Spanish – the FARC and ELN. These peasant-based rebel armies have the support of large numbers of people in their fight for liberation. Plan Colombia combines the U.S. fumigation strategy with death squads run by the Colombian military. The Colombian military is advised by U.S. armed forces officers. The aim is to ‘drain the sea, to kill the fish’ – to drive the rural supporters of the rebel armies out of their homes in the countryside, isolating the guerrillas from their supporters. The policy leads to mass killings, torture and the violation of human rights. For the Colombian government, the unexpected result of turning peasants into refugees is the spread of rebellion to other rural areas and the big cities. Colombia is rumbling like an oil well before it explodes!